Academics are working with Premier League footballers this season in the hope of creating a device that could, in future, be used to accurately detect whether a player is concussed, following an injury. Academics are working with Premier League players to create a device that could be used on the sidelines to detect whether a player has suffered a concussion. The University of Birmingham has enlisted the help of twelve Premier League clubs and their doctors. In recent months, saliva and urine samples have been taken from players, some of whom are injured, to support the research, which aims to enhance concussion diagnosis in football. As part of the new research, scientists examine molecules in a player's blood, urine or saliva that identify whether the brain has suffered an injury. In time, it is hoped the findings will enable researchers to create a device that can be used on the sidelines to help coaches and medical teams. There have been a number of high-profile incidents in recent years where footballers have experienced concussion. Republic of Ireland striker Kevin Doyle was forced to retire from the game on medical advice after suffering from persistent headaches and concussion. In 2006, Chelsea goalkeeper Petr Cech needed emergency brain surgery after fracturing his skull in a match against Reading. Cech has worn protective headgear in all matches since. Academic Neurosurgeon Professor Tony Belli said: "Early and accurate diagnosis of concussion is one of the biggest challenges we face clinically and is particularly a major concern in the sporting world. "How this [device] would work is you would take the saliva sample from the player after he or she is removed from the pitch. The saliva would then be put on a chip. The chip then gets inserted into the device and hopefully, within a couple of minutes, you get an answer of whether a concussion is likely to have occurred or not". The idea is that the technology could help managers to decide whether a player should remain on the pitch or not, following an injury or collision. In some cases, playing on with concussion can potentially create long-term health issues. England and West Bromwich Albion forward Jeff Astle, also known as "The King" among Albion fans, died of dementia in 2002. In a historic ruling, the coroner ruled the 59-year-old had died as a result of repeatedly heading a football. 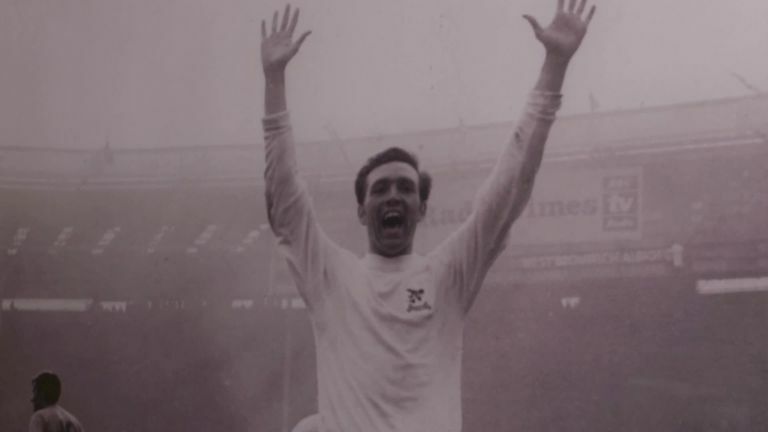 Astle's daughter Dawn, who has been campaigning for greater awareness about concussion in football, told Sky Sports News: "In dad's day if there was a clash of heads they were given a sponge at the back of the neck and smelling salts. Then they carried on again. "But now we know the dangers of repeated concussions, anything that can be brought into the game to make players safer and to protect their health in the long term, as well as the short term has to be positive". Many Premier League doctors have got on board with the latest research, which is being funded by the Drake Foundation. The overall aim is to expand the breadth of knowledge about concussion to ensure players are safe.